Iconic KLH loudspeaker brand founded in 1957 by Henry Kloss under new ownership of former Klipsch president David P. Kelley. Now under the leadership of former Klipsch president David P. Kelley, KLH Research and Development Corporation was originally founded in 1957 in Cambridge, Mass., by Henry Kloss, Malcolm S. Low, and Josef Anton Hofmann. The iconic KLH brand of loudspeakers is back. Originally founded in 1957 as KLH Research and Development Corporation in Cambridge, Mass., by Henry Kloss, Malcolm S. Low, and Josef Anton Hofmann, the company developed some of the biggest innovations in audio, most notably the Model Eight high-selectivity radio; Model Nine full-range electrostatic loudspeaker; Model Forty tape recorder, and Model Eleven portable phonograph with stereo speakers. Now the company is back under the ownership and direction of former Klipsch president David P. Kelley. The company is unveiling an in-wall voice-enabled amplified keypad and new premium stereo, home theater, and architectural loudspeakers. After leaving Klipsch as global sales president and board member, Kelley was presented with the opportunity to purchase the KLH brand. Recognizing the huge potential to capitalize on the pedigree of both the brand and its legendary founder Henry Kloss, Kelley acquired KLH in 2017 and assembled a team of former Klipsch and industry executives. The team consists of sales senior vice president Greg Topp; product development senior vice president Sal Cannatella; CTO Steve Howell; finance/operations vice president Jon Kerns; business development vice president Jeff Dano; marketing vice presidet George Harris and national sales manager Patrick Thompson. “I am taking the brand back to its roots, to Henry’s original mission, to build world-class loudspeakers and radios at affordable prices." "KLH is one of the most storied and revered audio brands in the world, founded by one of the most iconic engineers in the history of consumer electronics," says KLH CEO and president David P. Kelley. To that end, KLH will unveil a disruptive in-home streaming music solution, and an “ultra-competitive” high-performance line of in-room, architectural and outdoor speakers. KLH has created the VX-1 Voice-Enabled Amplified Keypad, a simple and cost-efficient solution to transform a single-source home audio system to a wireless multi-source streaming music system. Outfitted with Wi-Fi, Bluetooth with aptX, Hi-RES audio circuitry, and amplification, the VX-1 replaces the existing in-wall passive volume control while utilizing the existing speaker wires, making it easy to install. According to Kelley, millions of people can immediately benefit from this, as company research indicates that 8.5 million passive in-wall volume controls currently exist in U.S. homes today. The VX-1 becomes Alexa voice control-enabled when used with the free MUZO iOS / Android control app. In addition to this local zone, the addition of any Amazon Alexa device allows voice-enabled control of other sources/components throughout the home. The VX-1 is a world-first and patented, according to the company. The VX-1 has an MSRP of $199 with shipping slated for October 2018. “Our executive team together brings nearly 200 years of combined experience. Add to this our deep global manufacturing and distribution relationships, vertical integration and world-class engineering, and we’ve got a line so serious that we confidently pit each model against competitors’ similar designs including those considerably more expensive,” says Kelley. The KLH in-room loudspeaker line-up consists of 12 models. As a nod to the brand’s history, each is named after a street in Cambridge, Massachusetts, the birthplace of KLH. 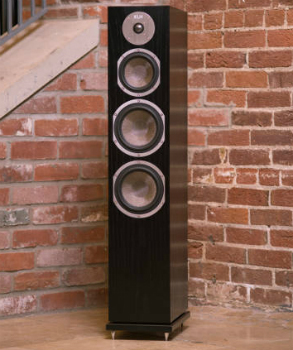 Models are Ames and Albany 2-way bookshelf; Kendall, Quincy and Cambridge floor standing; Story center channel; Beacon and Broadway surrounds; and Stratton and Windsor powered subwoofers. All boast real wood veneer finishes, the MDF cabinetry, internal components and dampening, and Kevlar drivers with anodized aluminum dome tweeters. To maximize floor models’ bass performance, incorporated are low resonance driver chambers with hand-tunable baffle ports. Named after physicist James Clerk Maxwell, whose name appears on a building at the Massachusetts Institute of Technology, which Kloss attended, these In-Walls are suited for 2-channel and home theater applications. All incorporate tuned, sealed back-boxes with MDF baffles, 6.5-inch Kevlar-coated fiberglass drivers, 1-inch silk dome tweeters, tapered array crossovers and gold-plated five-way push-pin binding posts. Several models are offered, with MSRP spanning $499.99 to $649.99 each for 2-way and 3-way respectively. Solving the common in-ceiling speaker problem of poor dispersion, the Maxwell In-Ceilings’ silk dome tweeter is mounted directly into the center voice coil of its Kevlar-coated fiberglass driver. This concentric design approach achieves broader dispersion, resulting in significantly better listening experiences for everyone in the room regardless of their location. Additional highlights include sealed tuned enclosures with integrated back cans. Three 2-way models are available. MSRP ranges from $299.99 each (5.25-inch driver) to $449 each (6.5-inch driver). Named after scientist Michael Faraday, the five Faraday in-ceiling models feature lower price points ($99.99 to $149.99 each), IMG woofers, soft dome tweeters, magnetic bezel-less paintable microperf grilles and gold-plated, five-way push-pin binding posts. The models range from 6.5-inch and 8.5-inch driver versions. There are also two all-weather models. "I'm hard to impress at this point in my career but KLH is not just another speaker company," says Bob Cole, president, CEO, and founder of CE Pro 100 integrator World Wide Stereo in Hatfield, Pa.
“It’s got everything you’d expect of a mature, premium brand but its brand-new and I think is going to be a major player. Somehow, David Kelley hits it out of the park, but I'm not surprised; he's old school with a fresh perspective. Speakers are what he’s always done, selling them, building them, marketing them. "He knows what to do. He understands what consumers want, what dealers need, and has the resources and team to achieve it. I trust him and believe KLH is the next big line to hang your hat on. If you are a smart dealer, you'll get to the InterContinental Hotel and check the new KLH out. It will prove a very pleasant surprise."